You may remember this post I wrote in November. Knives! Scary, scary knives! Well, I’m not becoming any sort of techy sewing machinery writer. But I’m writing this post today because it’s exactly the post I was looking for when I was making my next machinery decision. Also hopefully my last machinery decision for quite a while. If you’re not into talking about sewing machines and cover hems and what they do, then skip on down to whatever is next in your Google Reader. I’m sure Anna has something exciting today. Since I got that serger I’ve been thinking of trying a cover hem machine. An overlock serger does a great job with interior seams and construction, and adds elements of drama and danger with its superfast KNIVES, but I don’t care as much for serged edges that show. I like it used as an occasional embellishment, but when I try to finish garments with it I feel they tend to just look… unfinished. I wanted a machine that can make finishing the garment as quick as constructing the garment with an overlock machine. So I knew I wanted separate machines. But what kind? Well, there are “camps” in sewing machines. Those that know they’ll use a machine a lot and for a long time and see it as a long-term investment, and those who want to try something without such a big investment/commitment. That’s my camp. I’m not sure how much and how long I’ll use a specialty sewing machine– and I’m not ready to spend kids’ college money on one yet. The Bernina/etc. lovers make great arguments. I’m just not there yet. Maybe later? After all, I’m more the crafter than the sew-er of crafterhours. So after making a pile of knitwear and being frustrated by adjusting equipment to try to achieve what I wanted, I read a lot of reviews and made a decision. I already have this sewing machine and this serger, and this cover hem seemed the appropriate companion to them. Three brothers. Despite the fact that there was rampant sickness at my house when this thing arrived, I found the energy to open the box. There are a number of similarities between the new and old serger that I found comforting at first inspection. Colored wheels. Four tracks for threading. Makes sense. A little different… this one has threeeee needles. 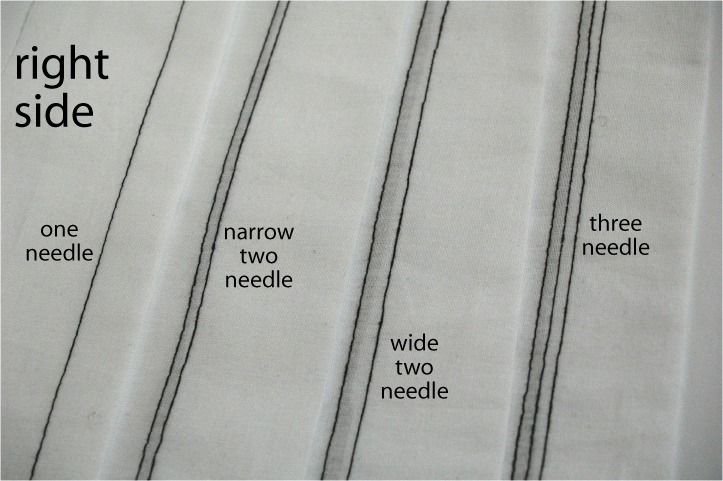 Three separate needles, so that you can sew… umm… let me add them up…. with any of eight different needle scenarios. That sounds right. And this one only has one looper. That part is a relief. I learned quickly with this machine that with only one looper and without the “chaining” that happens with an overlock machine, re-threading is a whole lot easier because you don’t have to pay attention to the order in which you thread the threads. Threading the threads. That sounds ridiculous, doesn’t it? 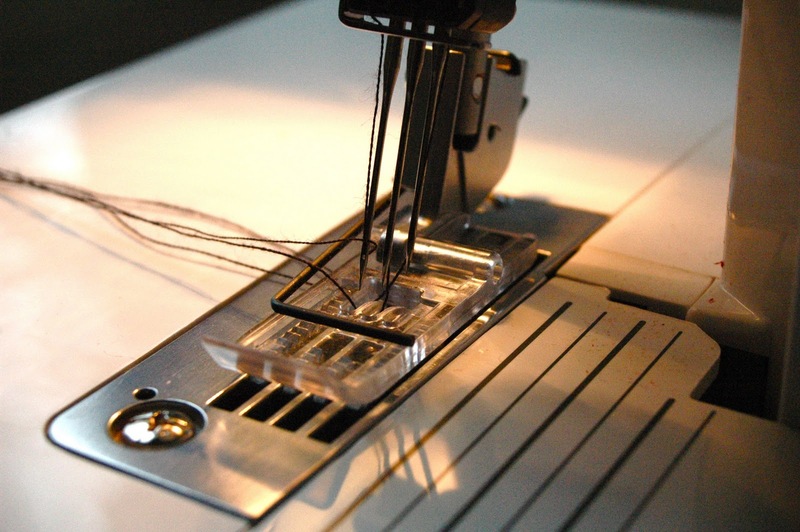 The differential feed thing-ys are similar to the overlock machine. I don’t really enjoy the term “differential feed”. It sounds algebraic, which brings up all sorts of painful high school memories. Arithmetic I can handle. Algebra not so much. This is the only cover hem machine I’ve ever tried. If I were going to get a fancypants one I’d go to a specialty store and try them all out. Come to think of it, that might be on my to-do list anyway so that if I’m ready for a new one, I know what I want. 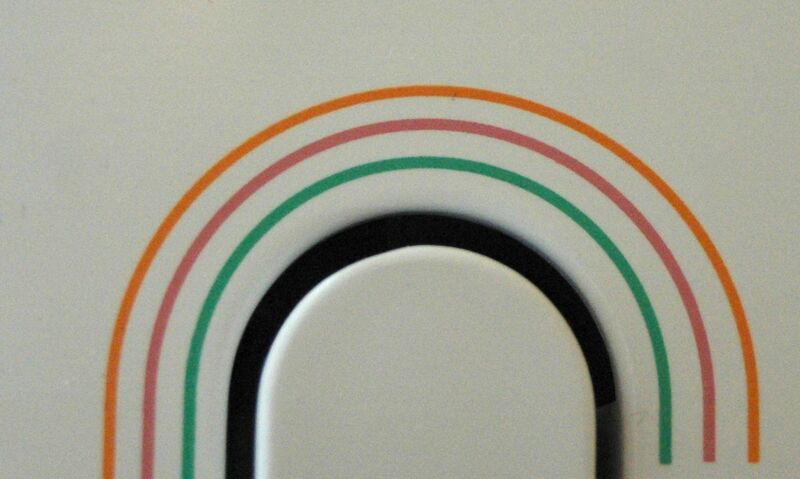 But for now, my favorite part is the rainbow found in the middle of the threading diagram on the machine. So enough about the machine, right? It’s the stitches that are important. Every single stitch this machine does is stretch-fabric-friendly. No snapping of stitches when exuberant 4yo tries on something new. 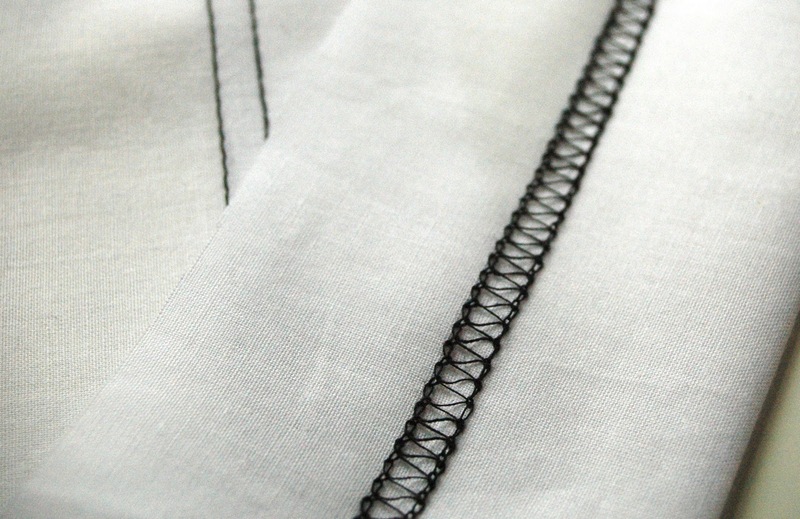 And because of the differential feed, no stretching of fabric trying to shove it through with a “stretch stitch”. Here I must sigh. All of the “white” fabric below looks different in these photos. I tried to fix it. I tried to make it all lovely. But if you’re still reading this you probably care more about the coverhem info than the beautiful photography, right? So let’s just look past it. As painful as it is. And like this on the bottom. 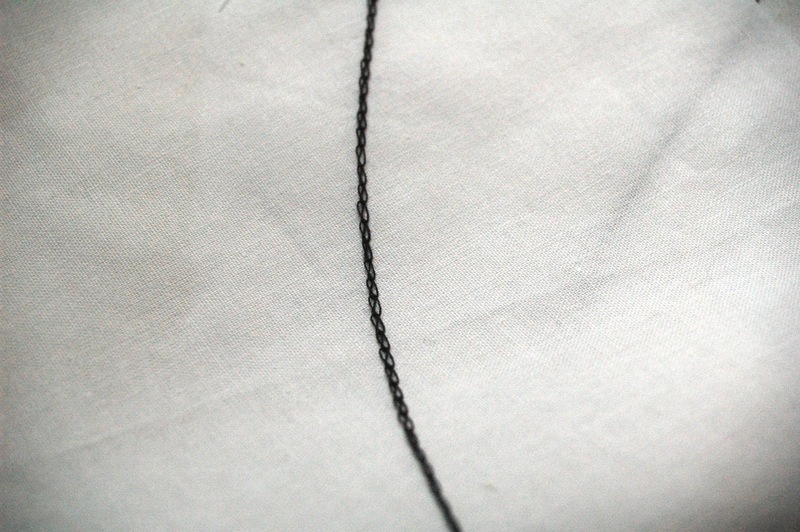 A chain stitch. I’m excited to use this one for embellishment. Although it’s a little tricky to sew looking at the wrong side of the fabric. I’m sure I’ll make it work. Which really adds some body to your fabric. Four threads’ll do that. One last point. My overlock serger did come with instructional videos that were very helpful. Dated and somewhat comical, but helpful. This one doesn’t. So getting used to setting it up to sew took two evenings of trial and error. But now we’re old friends. And belting out t-shirt dresses. And that’s it! Well, that’s all I have to say about it. Have a question? Bring it. I’m sure I forgot useful points as I was distracted by photography woes. P.S. Have you seen Heather Bailey’s March of the Tools? I’m linking this and then checking in to see what others are writing about. Because I love reading about what others are using and how it works. What a great and super informative post! This machine is one I thought I could do without….now officially on my list! Thanks for taking the time to share! Needless to say, I have some more learning to do yet. Why do I feel like I need one now? I have a question–why is it called coverhem? What does that meeeeeaaaannnnnn? This is a great post. Just a question though- or maybe some advice? 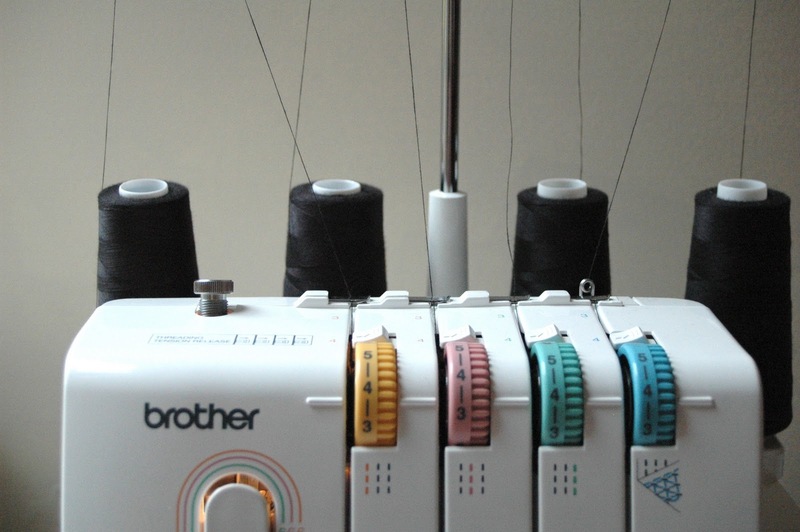 I only own a sewing machine- just a sewing machine which I adore, also a Brother. I have been thinking of buying a serger for more knit fabric sewing. But this option makes me wonder if I would benefit more from the serger or this machine. Any good thoughts? I’m a little confused on it all (clearly!). Thanks so much! Love your blog!! thank you so much for this. I can’t afford/justify one of these right now, but it’s sure nice to think about, and this is the most affordable one I’ve seen. It was nice of you to take the time to post about it. So… I have the exact same sewing machine and have been thinking about the same serger, so I imagine this machine is in my future too :)… one thing at a time though. Thanks for the thorough walk through! Oh, and on the not-exactly-matching photos… I so feel you. I totally wouldn’t have noticed but I definitely stress about that too. Cut it out. Now I want one. I’ve been wanting one of these for so long!!! Oh, the envy! 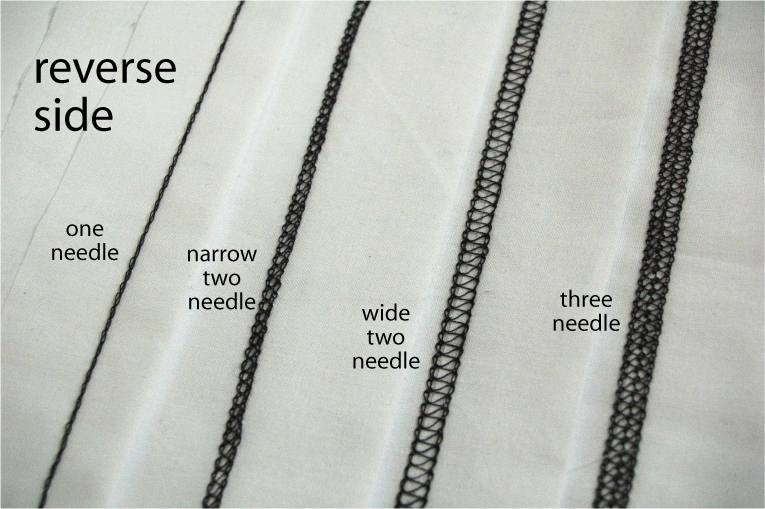 This is a great post – this and the serger post are so helpful. I’m leaning towards getting a serger – but now I’m wondering about this. Do I need both? 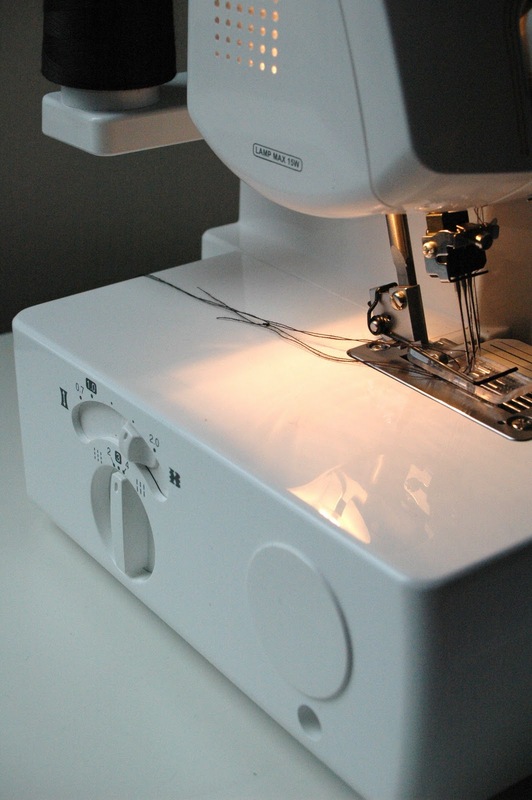 This feels like a newbie questions – but when would you use the serger and when would you use the coverstitch? Hi, quick question: Is this machine just used for decorative stitching though? Or does it have any other uses? I have the same Brother serger as you and LOVE it! Oh you made the right choice! The super duper fancy machines that do serged edges and coverhem are a pain in the you know what! To switch them over is crazy hard. I really like separate machines. Sewing with knits rules! 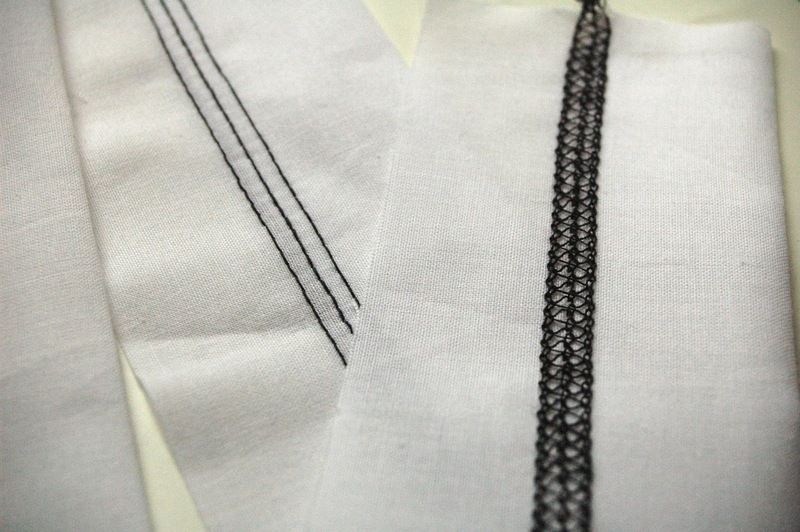 Can you use non stretch fabrics with the coverhem machine? hi, love ur post. the only one i finally found after weeks of searching on the net. 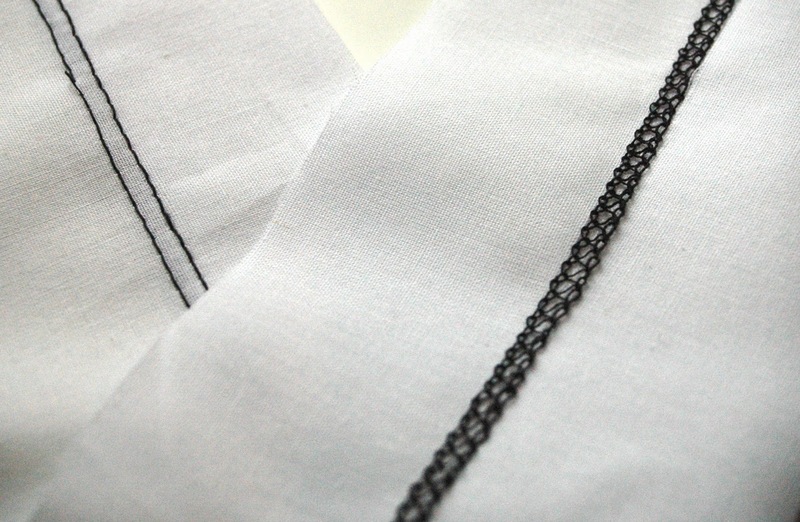 Chain stitch, this is what i was looking for. i didn’t see anything about how to thread for stitching chain and the differential feeds and stuff. mine is serger 1034 and only has 2 needles. could u please post pictures of that too.. Fantastic and informative. Your pictures are very helpful. Please post more pics and information about the special feet that came with the machine. Question: I have a Janome Coverstich machine and it has a tendency to skip stitches on bulky seams. (I see this complaint A LOT online). Do you find that you have this issue with this Brother machine? I haven’t had that problem. 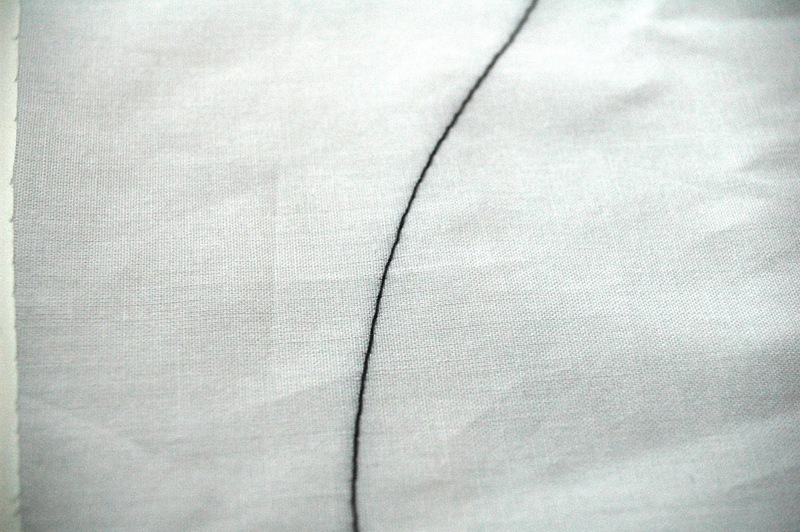 I tried to hem with double needles years ago, but they never look quite as nice as a cover stitch hem. I have a Janome, love mine. It was a pain at first, but then I watched a video on line (Janome) and it showed everything I needed to know. When I forget how after not using it for awhile I always go back to the video. I just love these learning free videos online. Thanks so much for this information. I also have the itch for a cover stitch machine. Basically, I am short and need to hem anything I purchase even tee shirts. They are such a pain, but I think this affordable machine may be the fix. Thanks again. Hi! Wow I am impressed with this tutorial. I wish I would have found this before I paid for a sewing lesson to earn this technique but there is literally nothing on the internet to help! I have one question- I have been racking my brain and cannot solve it. I am making reversible swimsuit bottoms using this technique. My only problem is the final hole- I don’t want to hand sew. Do you know any other ways to close it? Aka fuse/ glue? It’s spandex material. I would appreciate it sooo much!! I’ve got nothing for experience in Spandex adhesives, bummer! I’d love to hear what you figure out, though! Are you still using this machine? Still enjoying it? Do you wish it had free arm for, eg, sleeves? I still enjoy it when I use it – though I should probably use it more often. I don’t wish it had a free arm – because it doesn’t sew in the round. It prefers straight or almost straight lines. So when I do sleeves I hem them first and then close the sleeve seam. 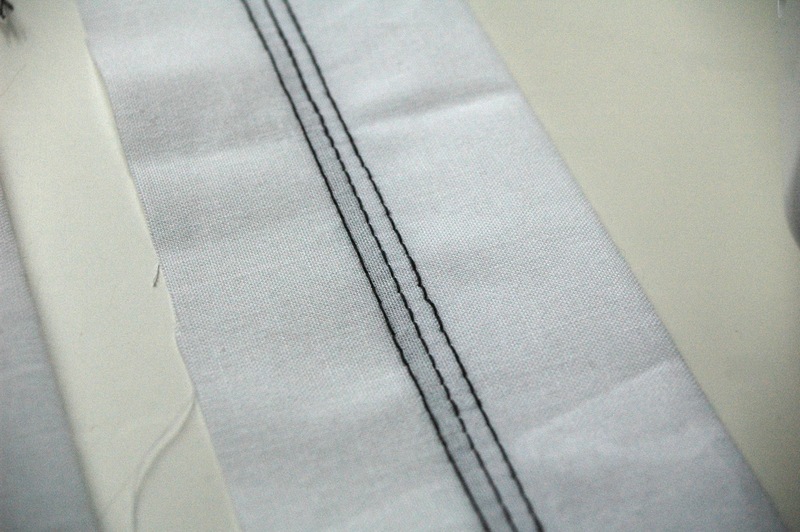 Does the coverstitch machines not trim the wrong side part of the hem? What if I am hemming a fabric that is not a straight edge, but rather cut using scissors by a girl who didn’t cut perfectly straight? 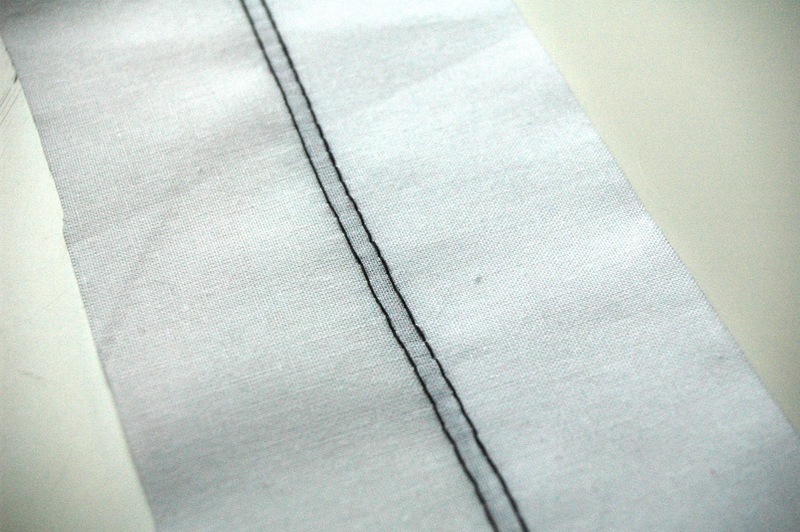 Will the backside of the hem need to be manually trimmed, or will the coverstitch make it look finished in one go, analogous to seams with a serger? It depends. 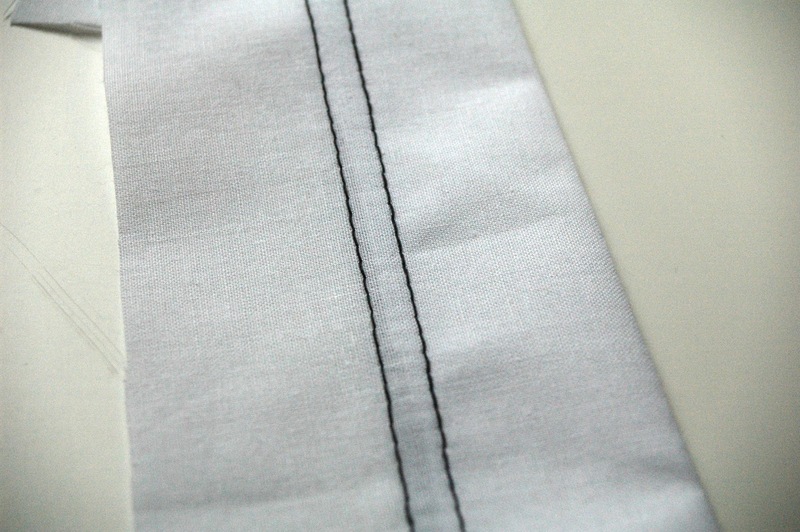 If it’s a very small variation, it’ll be caught up in the width of the seam. But if it’s off by much you’d have to trim. I’d probably just straighten it up myself before hemming.